Rice Pudding is an ambrosial Indian dessert be it known as Kheer in the north or Payasam in the south, better yet Payesh in the east. 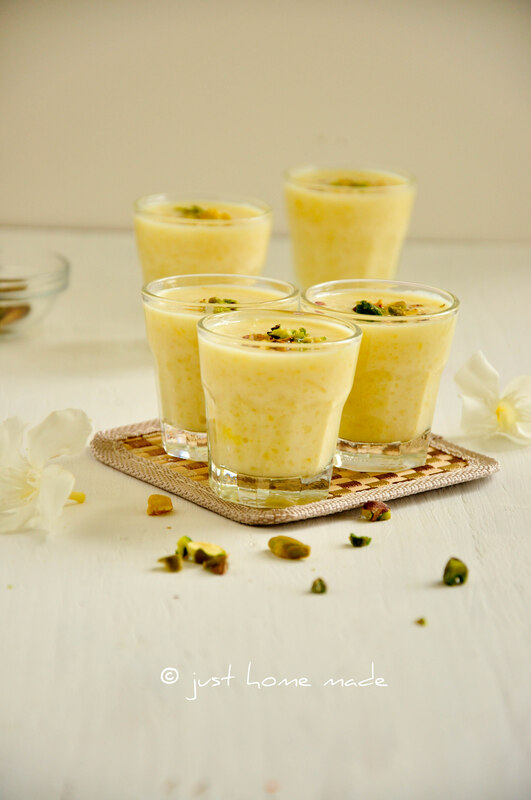 Sure to be made on festivals and birthdays or for any celebrations big and small, it certainly takes the sweet spot as one of my favorite milk based Indian desserts. 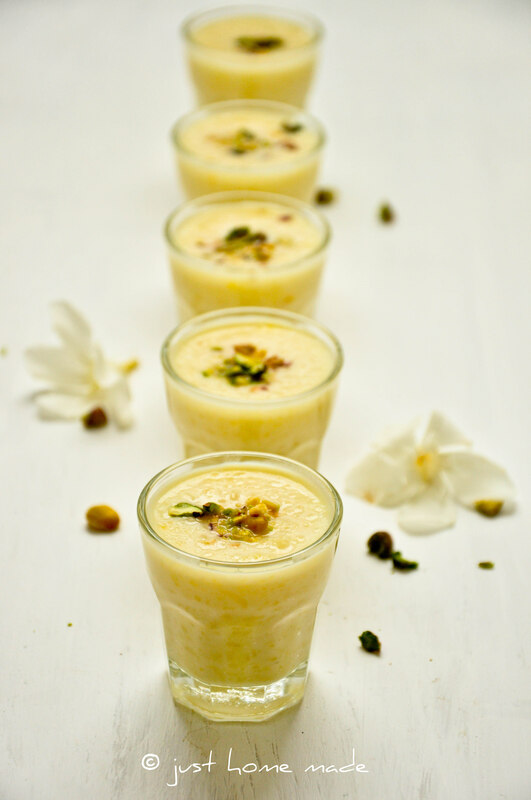 Payasam is not quite a novelty to anyone from the urban middle class of South India. This pudding too by that definition is somewhat similar. It has rice and it has milk. The distinction of it lies in the elite choice of ingredients that set it apart from the rest. I wish I could find a better translation for Mawa. Even wiki couldn’t find me a better choice. Solidified milk neither sounds as cute nor represents the richness that ‘Mawa’ does. Even then, I am forced to stick to it for the lack of a better word. What is Mawa? Good question. Mawa is the end product of slow cooking or simmering whole milk until it loses most of its moisture resulting in a semi solid mass. And yes, nothing less than whole milk will do. It is not that Mawa cannot be made from non fat milk, but Mawa isn’t Mawa minus the fat. Something like say what is cream without the fat, right? There are many versions of Mawa based on the amount of residual moisture and the texture of the end product. Beyond that is a little out of scope here, if you are curious, wiki will tell you more. Payesh as I have learnt is a Bengali rice pudding. Technically speaking, I’ve never once set foot on the Bengali soil, so how am I better equipped to talk about it? Not quite. All credits must go to Attayya who in fact has traveled far and wide as well as lived in many parts of the Indian subcontinent and as she did, one thing she never missed was adding distinct recipes from the local food culture to her repertoire. And me? I just got lucky to be part of this chain. Authentic or not, this recipe is for keepers. The only thing I’d like to see different next time probably is jaggery in place of sugar. If you ask me how it is? It tastes exactly like how any good rice pudding should, a tiny bit chewy, a whole lot creamy and luscious all the way. The aroma of rose-water and the flavor and nuttiness of pistachios is perfect. Substitute it with almonds or cashews or anything else and it won’t quite cut it. Pure rose-water smells heavenly and lends itself beautifully to everything that it comes in contact with, making it simply delicious. That of Mawa Payesh is no different story. The best food memories are from the growing up years, in my opinion. 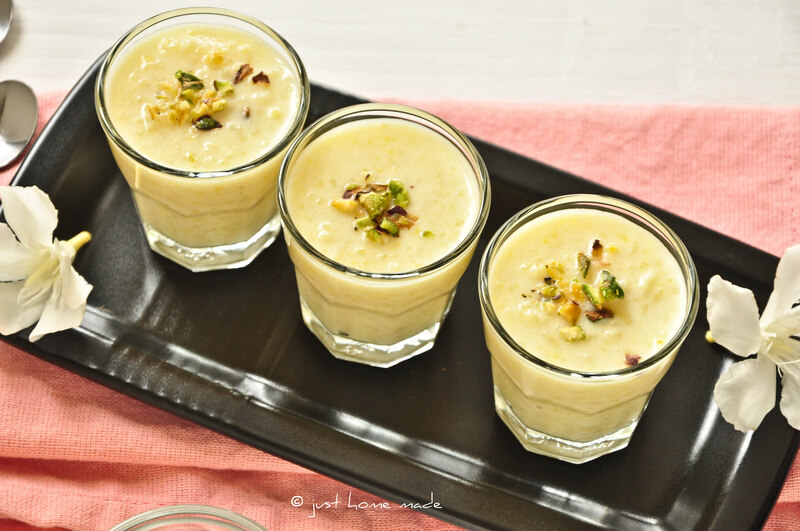 For the lack of such an association with Mawa Payesh (I’ve just been introduced to it a few weeks back) let me ask you this, if you’ve grown up relishing this pudding or anything similar, what fond memories does it bring back for you? Wash basmati rice until the water runs clear. Strain well and keep aside for 30 mins. In the meanwhile, if using frozen mawa thaw by letting it sit on the counter until it can be handled, then crumble with your fingers and set aside. Heat ghee in a heavy bottomed pot over medium heat. When ghee is hot enough or fragrant, add the strained rice and sauté until rice appears translucent or about 5 mins. Add milk and water to rice and bring it to a boil. Crush saffron strands between your finger tips and into the pot. Stop for a minute and savor the sweet aroma of the saffron residue on your finger tips, this is the part I love most, of cooking with saffron. Now simmer covered until rice is soft and well cooked but not mushy or about 15-20 mins. Stir intermittently to prevent Payesh from sticking to the bottom of the pot, getting burnt or boiling over. Mix in crumbled mawa and stir well to combine. Add sugar and stir until dissolved. Do not cook any longer once sugar has been added or you’ll risk rice turning rubbery. Take the pot off heat and cool to room temperature. Finish by stirring in the rose essence and refrigerate for at least 2 hours before serving. Serve chilled in a small clear glass with banana slices (optional) and/or slivered or crushed pistachios on top. Add rose-water to hot payesh or the rose aroma evaporates due to the heat. Skip setting the strained rice aside for 30 mins. It is essential for the basmati rice to cook well. Add sugar only after rice is thorougly cooked. Mawa can be either store-bought or home-made. Though making Mawa at home is a tedious affair, that home-made taste is often compromised in the store-bought ones. If you have the time and patience, go for it. Here are some super easy ways to make your own using evaporated milk and dry milk powder. Mawa is usually available in world food markets or Indian grocery stores in frozen form. Add only just enough saffron as mentioned to add a touch of color to Payesh so that saffron aroma stays from clashing with that of rose. If using rose essence, add a few drops and check first and adjust accordingly. Do not add all at once as essence is much stronger than rose-water. Pure rose-water is simply the distilled water of roses. I have used CORTAS rose-water with ingredients listed as only distilled rose-water. Rose essence however almost always comes with some kind of alcohol along with the rose oil. As mawa is rich by itself, I have used non-fat milk. However, go for 2% milk or even whole milk if you are looking for a richer and creamier Payesh. If you want to make this recipe healthier, substituting white basmati with brown basmati rice would be a good start. Those look wonderful!! I am a huuuuuge rice pudding fan, and I love rose flavored sweets. They must taste like heaven, I can only imagine how great the floral flavor must go with the creamy rice pudding. Yum! Thanks Eva. I am a rice pudding lover too and take it from me, the rose flavor really makes this one so distinct. Can never stop with the first helping! 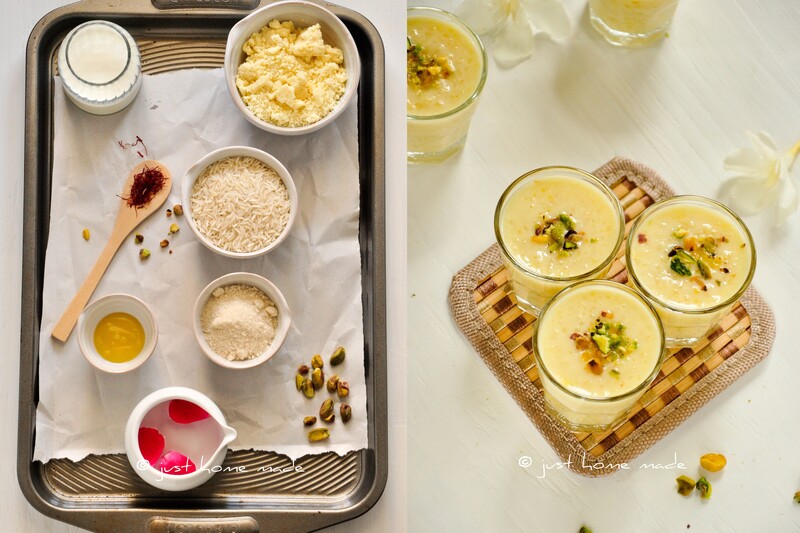 What a lovely recipe.. looks simply amazing and delicious.. inviting clicks !! Your Okra Pakoda recipe is very interesting. Got to try it sometime! beautiful! I haven’t tasted this at all! Thank you, it is my favorite too.. Thanks Mark. Good choice, it is totally worth going for the second helping! Just checking if you have received our last couple of emails? Hope they are getting through. Yes Kankana, I learnt that date palm jaggery is used in the traditional bengali style Payesh and I may never get to eat it! This is a different version, from my mom-in-law’s recipe collection. Hi Radhika…first time here and just loved the gorgeous pictures and the lovely food here. 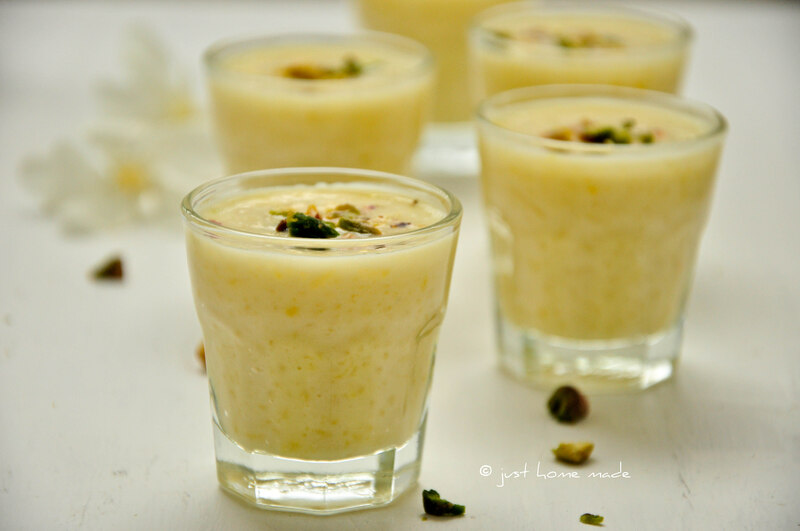 This gobi mawa ki kheer has been a favorite. We make a gajar mawa ki kheer too. Thanks Sangeeta. Wow! Can’t imagine cauliflower (gobi) in a mawa ki kheer.. very intriguing… How is it made? oops …it is gulabi mawa kheer . Hmm even more rich !! Hey, what a presentation! I loved all your pics and the recipe is, of course, good!! So good to see you drop by Manju, Been so long! Same pinch on that, rice pudding is my favorite too. 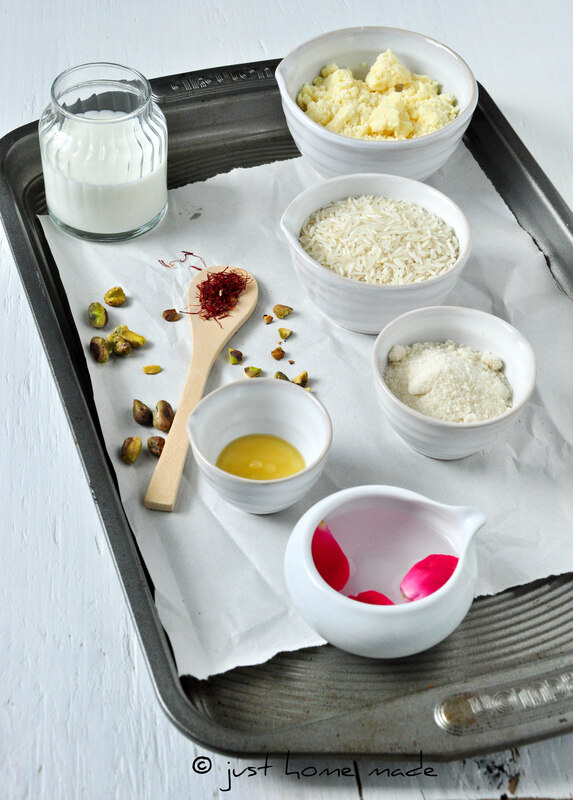 Got to know the recipe for the coconut rice pudding, is it on your blog? This looks delicious, Radhika! Now I am going to have to veganize this somehow. Your website is thoroughly delectable! I love my rose water essence and add it everywhere I can.